Dødsmaskin, meaning “death machine” in English, is a Norwegian post-industrial / drone act by Peter Vindel and Kjetil Ottersen. 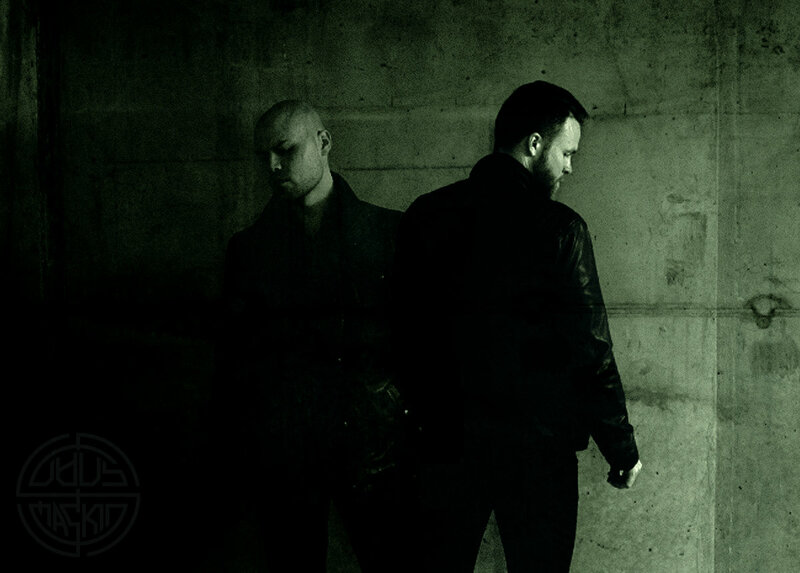 They self-released a digital album in 2015 entitled, Ingenting (“nothing” in English). On that debut they showed a lot of promise and a general sense of talent in the noisier side of drone music. But their physical debut on Malignant Records, Fullstendig Brent (Completely Burnt; Holocaust) takes them into some amazingly complex territory. This is one of those rare gems in which utterly chaotic noises are able to mingle perfectly with the serenity of dark ambient. This album could fit into many categories, post-industrial, drone, dark ambient, death industrial, power electronics. Indeed, there is a bit of all these genres presented here. This album will be particularly pleasing to anyone with a love for the darkest days of history. The inner panel of the digipak consists of one sentence, “Djevelhorer Skal Brennes – Martin Luther (1537)” This can be translated to English as “devil whores be burned.” It is a fitting preparation for the onslaught of soundscapes presented within. Fullstendig Brent takes us on a deeply cinematic journey back in time to the 17th century in the northern parts of Norway, specifically to the fortress of Vardøhus in Vardø, the center of Norwegian Finnmark. This fortress would play the stage to a particularly dark and brutal period of history. We are taken here at a time when witch trials were being carried out around the western world. Each track on Fullstendig Brent gives us a glimpse into various times during these proceedings. “Båldom” stands as an introduction to these nightmares. It is translated to English as “Verdict of Fire”, an allusion to the preferred method of dispensing of witches once their guilt was proven. “Båldom” is a perfect example of what to expect from Fullstendig Brent. The track starts with the sounds of a raging fire. A beautiful, if melancholic, loop of drone-work takes the forefront. It truly sounds majestic in its sense of foreboding. After this goes on for a short period of time we are cast into the fires, where our sins may be purged, before the eyes of the faithful. It is a descent into a truly cacophonous noise. Yet, with the brilliant talents akin to Jarl or Steel Hook Prostheses, these sounds never lose their focus. It is a perfect execution of brilliant noises. The cinematic edge is taken to an even more obvious place on “Christoffer Orning”, named after a notorious district governor responsible for the majority of deaths of innocent women and children. The track starts out with prayers being begged in unison by the demented congregation. After they give their blessings, the witches are allowed to burn for their sins. As the beating industrial noises completely overtake our senses, it’s easy to imagine these so-called witches perishing in the most horrible way imaginable. 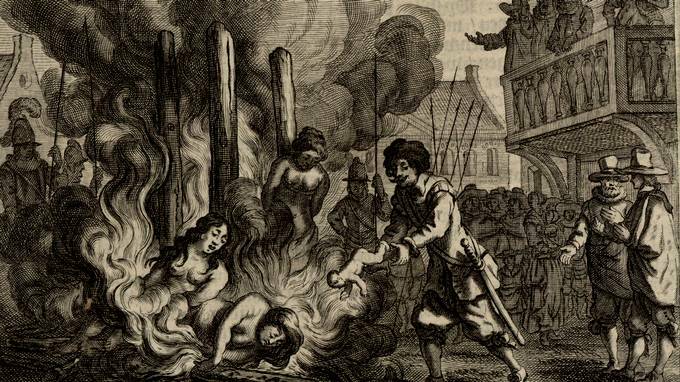 Their body slowly roasting on the pyre, they shriek in utter despair soon followed by the sobbing of this unlucky female victim, attempting to alleviate some of the pain as she begins to smell her flesh being cooked, long before losing consciousness or dying. Each track on the album goes through these ups and downs of subtle preparation followed by industrially induced terror. The true beauty of the music is that at no point do the sounds become overwhelming. They perfectly play their role, dragging the listener so close to the action that they will undoubtedly have their minds filled with the images of these brutal acts of Christian fanaticism. Part of the praise for this feat should be given to the mastering talents of Rafael Anton Irisarri working his magic from the Black Knoll Studio in New York. Equal thanks can be given to the brilliant artwork of Sense:Versus on the digipak. The front cover adorned in a minimalistic fashion with the Dødsmaskin logo, set behind a single leap of flames. The digipak is textured, with a rustic border, giving it the impression of an old worn leather book, possibly even bound in human flesh. Dødsmaskin clearly paid the utmost attention to detail on Fullstendig Brent, which is undeniably present throughout the entirety of the album. There is never a moment wasted, each second holds our attention with its simultaneous beauty and ugliness. I would especially recommend this album to fans of cinematic dark ambient who also enjoy some noisier genres like death industrial or power electronics. Yet, there is really no reason to warn off others. This album is a miraculously well prepared example of how music can go above and beyond genre labels. While it may be significantly harsher than many listeners are used to, it should be a welcome novelty, a way to truly appreciate what is behind the thoughts of many musicians of the post-industrial scene. Many of them could surely learn a thing or two from Dødsmaskin.